Till now I have brought you stories of sportspersons from diverse sporting arias like Cricket, Hockey, Gymnastics and Tennis. But I have not yet touched on an extremely popular sport that is played by as many as thirty-six countries in the world. Yes, you guessed right. Today's sport is football and the person whose achievements I am going to highlight is none other than the wizard of the football field, Lionel Messi from Argentina. Another thing I want to mention is that this article is dedicated to Master Tuneer Bannerjee who is the 3.5-year-old son of my dear friend Sonia Chatterjee Bannerjee and Mr Tanmoy Bannerjee and who would be taking baby steps into school the coming academic year. 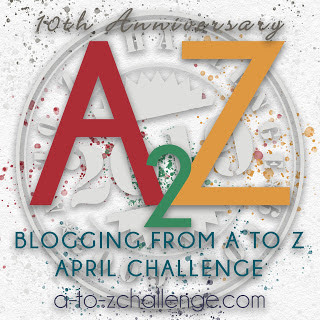 Many of you might be following Sonia's extremely entertaining posts for the A to Z challenge 2019 in which she regales us with her experience as a parent trying to secure admission for her young son in school. Getting back to football and the subject of this post, Lionel Andres Messi Cuccitini is the third of the four children of Jorge Messi and his wife Celia Cuccittini. Jorge was a steel factory manager and his wife Celia worked in the magnet manufacturing workshop. Lionel Messi's date of birth is 24, June 1987. He was born in Rosario in Argentina. His family was very much into football and young Messi developed a keen interest and love for the game at a very young age. Messi joined the Newell's Old Boys club in Rosario when he was six years old. He played as part of a youth side named 'The Machine of 87' in the club for six years and scored nearly 500 goals. When he was ten years old Messi was diagnosed with a growth hormone deficiency that threatened his professional career. The cost of treatment was nearly $ 1000 a month. Messi's family had relatives in Catalonia, and in September 2000 they arranged for a trial with the Barcelona club. Charly Rexach who was the team director wanted to sign him, but the board of directors of Barcelona were not too keen because at that time European clubs rarely signed foreign players at a very young age. On 14 December, Barcelona finally offered Messi a contract. Messi's family moved to Barcelona in February 2001, into an apartment near the Barcelona club's stadium, Camp Nou. Initially, Messi faced some problems due to a transfer conflict with Newell's and could not play. He was a foreigner and could only be fielded in friendly matches and the Catalan league. This made it very difficult for young Messi to integrate into the team as he was also a reserved person by nature. His mother, his brothers and little sister, María Sol moved back to Rosario while he stayed in Barcelona with his father. Messi's completed his treatment for growth hormone deficiency when he was fourteen. 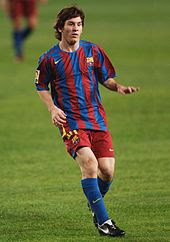 Messi rose rapidly through the Barcelona club ranks and on 24, June 2005 he signed his first contract as a senior team player. This date incidentally coincided with his eighteenth birthday. By the time he was 19 years old, Messi had established himself as one of the best players in the world. He scored his first hat-trick of goals on 10 March 2007 and was the first player to do so in 12 years, equalising after each goal by Real Madrid to end the match in a 3–3 draw. His importance to the club grew and he signed a new contract with increased wages. He was already being compared with his famous fellow countryman Diego Maradona. He reinforced this reputation by scoring a goal very similar to Maradona's goal in the FIFA World cup of 1986 which is commonly known as the 'goal of the century'. Just like Maradona Messi collected the ball near the right side of the halfway line and got past five defenders, running sixty meters and scored the goal. Messi played in the right wing initially. The year 2012 proved to be a record-breaking one for Messi. On 7 March, he achieved a record that was unprecedented in the history of the Champions League by scoring five goals in the last 16-round match against Bayer Leverkusen. This achievement made him the top scorer with 14 goals, tying Jose Altafini's record in the 1962–63 season. He also became the second player after Gerd Muller to be top scorer in four campaigns. Playing for Barcelona, Messi also scored twice in their 3–0 semi-final victory over Bayern Munich. His second goal came just after three minutes of his first. He scored the second goal by chipping the ball over the goalkeeper Manuel Neuer after dribbling it past Jerome Boateng and making him drop to the ground. This goal went viral and became the year's most tweeted sporting moment. It was also named the best goal of the season by UEFA. On 6 June, Barcelona defeated Juventus 3–1 in Berlin to win their second treble, becoming the first team in history to do so. For his efforts during the season, he received the UEFA Best Player in Europe award for a second time. A couple of weeks later, on 20 March, Messi became the top goalscorer in Barcelona's history at the age of 24 overtaking the 57-year record of Cesar Rodriguez's 232 goals. Throughout 2013 Messi struggled with injuries. The 2014 FIFA world cup was slated to be played in Brazil and there was a lot of doubt about Messi's form as he had finished an injury-ridden season with Barcelona in 2013-2014. But before the world cup, his form returned and he came up with some stellar performances. He was picked as captain of Argentina. In the first match of the world cup, Messi led Argentina to a 2–1 victory over Bosnia and Herzegovina. This was followed by a win over Iran, securing Argentina's qualification for the knockout phase. Messi assisted in a goal in extra time to ensure a 1–0 win against Switzerland in the round of 16. This was followed by a 1-0 victory in the quarter-final against Belgium, and Argentina was in the semi-final of the World Cup for the first time since 1990. Argentina defeated the Netherlands 4–2 in a penalty shootout to reach the finals against Germany. The final match of the 2015 world cup was labelled as Messi was Germany, the world's best player versus the world's best side. Messi had started the play that led to a goal in the first half hour but unfortunately, it was ruled offside. Throughout the match, Messi proceeded to miss opportunities to open the scoring, in particular at the start of the second half when his breakaway effort went wide off the far post. Finally, in the 113th minute Mario Gotze of Germany scored, in the last minute of extra time by a free kick that Messi sent over the net. To Argentina's dismay, Germany had won the match 1–0 and had claimed the World Cup. But Messi had his moment of glory when he was awarded the Golden Ball as the best player of the tournament. However, his selection drew criticism as he had not scored goals in the knockout rounds. FIFA President Sepp Blatter expressed his surprise, and Diego Maradona suggested that Messi had undeservedly been chosen for marketing purposes. The world cup was followed by the third final of Messi's international career in the 2015 Copa America, held in Chile. Argentina entered the tournament as title contenders due to their second-place achievement at the World Cup. In their first match against Paraguay, Argentina was two goals ahead at half-time but the match ultimately ended in a 2–2 draw; Messi had scored from a penalty kick, which was his only goal in the entire tournament. A statue of Lionel Messi was unveiled in the capital by the Mayor of Buenos Aires Horacio Rodríguez Larreta to convince him to reconsider retirement. Messi finally came back from retirement on 12th August of that year. But in the 2018 World Cup Messi did not perform too well and even prior to the cup there had been speculation that this would probably be his final world cup. He did not participate in too many games in 2018 but in March 2019 he was again called to the national squad for the friendlies. I would like to say a few words about Messi's playing style. Messi is not very tall and consequently he has has a lower centre of gravity than taller players. This enables him to be more agile and change direction more quickly and evade opposing tackles. Because of this, he has been dubbed La Pulga Atomica or 'The Atomic Flea'. As regards Messi's personal life he has been in a relationship with Antonella Rocuzzo since 2008 when he was twenty years old. Roccuzzo and Messi have known each other since the time Messi was five years old. Rocuzzo is the cousin of his best friend since childhood, Lucas Scaglia, who is also a football player. Messi first confirmed his romance with Rocuzzo in an interview in January 2009, before going public a month later during a carnival in Sitges. Messi and Roccuzzo have three sons, Thiago (born on 2012), Mateo (born on 2015) and Ciro (born on 2018). Messi is Argentina's pride and rated as one of the greatest footballers the world has ever seen. I hope you enjoyed reading about Lionel Messi. Tomorrow I will be back with you with another sporting great. Till then Adieu. Yes, his loyalty to Barcelona is something really remarkable. He is a great player with great values. Thanks for visiting. Jai, I simply loved that you dedicated this post to Tuneer!! How nice of you to do that. I love Messi, as apart from being the phenomenal player that he is, he is such a gentleman . I had no idea that he had a growth hormone deficiency, though I have always noticed that he is rather small, even fragile, as compared to other football players. Yes, Sonia had mentioned to me that Tuneer was familiar with names like Dhoni and Messi, so I thought I would dedicate a post to him. Yes, Messi did have a hormone deficiency. Thanks for visiting. Jai uncle, a big hug and love to you from Tuneer. He is jumping with joy as I told him that you have written this post for him. Everyday I would read out your posts and translate them to Bengali. Tuneer and Tanmoy are big fans of Messi. And my whole family is a die hard Argentina supporter clan. Messi really stands for a lot of values that are often missing in the football field. Thank you, little Tuneer, for all the love and many hugs to you too. I am happy that you liked my post written specially for you so much. And I know you love MEssi. Have a great time at school the coming year. Yayy I'm thrilled to see this post Jai. First things first, love that you dedicated this to little Tuneer. So heartwarming it is. I remember 2015 Match when Germany won the trophy but this stud Messi won the hearts. That was the moment!!! Loved this post so much and glad we r sharing the same player today. Yes, Thanks Vartika. Germany won and unfortunately Messi could not hold the world Cup aloft for Argentina. Thanks for visiting. I am by now very familiar with little Tuneer and his school admissions. Lionel MESSI is my son’s fav football player. I sit with him to watch the games even though they are telecast late in the night. He explains all the intricacies of the game. Now i find the game interesting. I remember PELE, The black Pearl , as the greatest football player. Yes, Pele was the ultimate genius of football who was rated the best of all. Thanks for visiting. Yes I have been following Sonis's posts, they are indeed very interesting and remind me some of the incidents which I faced while trying to get an admission for my daughter. Messi - the iconic player ... he is a heart throb of girls and just makes the game a little more memorable. Messi is indeed the heart throb of many girls and is a great player too. Thanks for visiting Shubra. Fantastic post and such a lovely gesture to dedicate it to adorable Tuneer. This can be one way to encourage kids to sports! It might not be the right comparison but Messi is like the Tendular of football. Both of them didn't have the ideal 'sportsperson frame' but they used their skill and extreme dedication to their advantage. Messi was a real whiz in the field and seeing him goal gave me goosebumps! Wow he's my elder son's ideal and favourite, all over his room he has his posters. Sure gonna ask my kiddo to read this post. His finishes, smashes, goals are a regular seen at my home. I ahve stayed awake with him in all FIFA matches whenever messi use to play. Great post. He seems to be the favourite of quiet a few people. Thanks for visiting Pragun. Thanks for visiting Namratha and thanks for the comment. Yes, little Tuneer is everywhere as you say. Thanks for visiting, Priyanks. His physical condition became a blessing in disguise for him. The last lot of the traditional play. Nice work sirji. You are correct, Manas. Thanks for visiting. Well, Messi is the favourite of many youngsters. Thanks for visting Suhasini. I'm not usually one for sports related articles, but this post was so informative and kept me interested throughout. I also feel a particular affinity for Messi because he and I are the same age. Thanks for visiting. Happy that you enjoyed the article. First thing, writing this post for Tuneer made me awww. As usual you have excelled in collaborating facts and stories with respect to Messi. I have great respect for him, today came to know much more about his life. Thank you for this, Sir. I didn't know anything about football until I got married to a Messi fan. I watched Messi play during the 2015 world cup and though he didn't score much in the knockout rounds. However, I was mighty impressed and has been a huge fan myself ever since. It broke my heart to hear his retirement plans but was elated when he decided to come back. Thanks for all the information you gathered here. It truly made my day.